Rustic and fall go together like apples and pie. This adorable couple’s West Virginia wedding took that classic autumnal vibe and danced into happily ever after with it! Their elegant-meets-bucolic celebration began with a joyful church ceremony, after which Katie and Joey savored the moment in the most delicious golden sunlight. Then it was off to Edgewood Country Club in Charleston to celebrate (isn’t the signage welcoming everyone to the party fun?!). These two are so cute together. 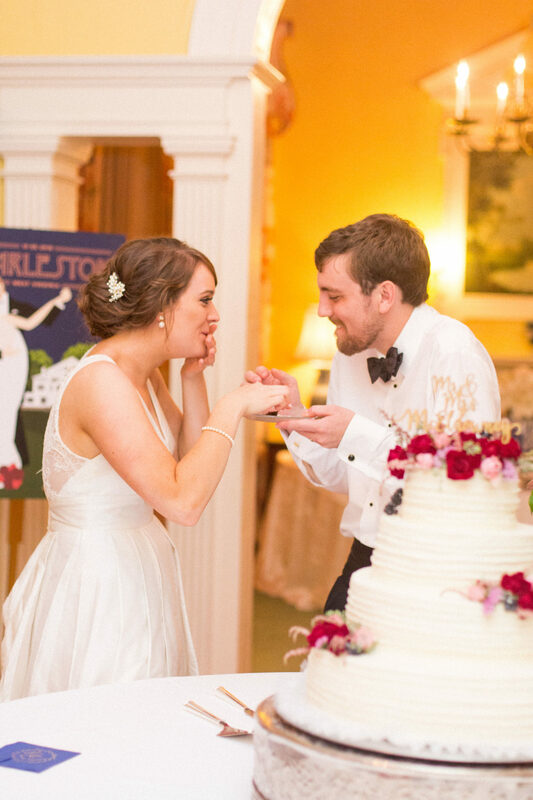 The delight they share in one another is palpable in every shot (check out their cake moment!). That warmth filled their day to the brim, bringing vibrancy to every beautiful detail, from the pretty ribbon streamers tying the bouquets and sapphire bridesmaid dresses to the tux-wearing groomsmen and timeless cake with a golden topper. Thank you for the feature!! Katie made the most beautiful bride in her Astrid & Mercedes Cherish gown!